Gauge 30 stitches, 42 rows to 10 cm/4"
Fabulous, durable sock yarn in happy colors! 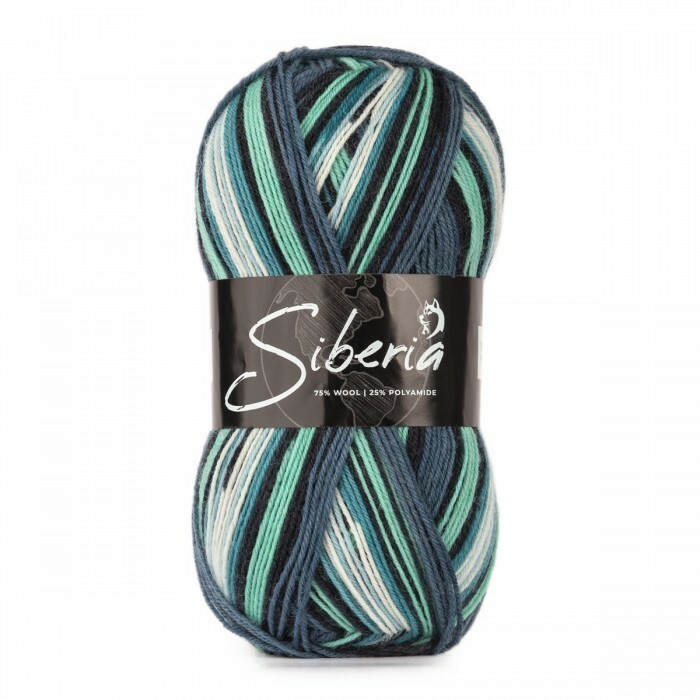 Siberia is produced from a really great quality of wool, reinforced with polyamide. Siberia has a beautiful, classic look due to its pretty Jacquard print. Your result will look like a pattern knitting, but it’s very uncomplicated to make. The nice effect appears all by itself while you knit. A good wool with long fibers has been used and combined with polyamide, your knitted socks will be extra durable and last for a long time. Siberia is machine washable, so you can safely wash your socks on 86℉ (30℃). Just remember to use wool detergent and as always when washing wool, omid fabric softener completely. Very nice yarn for sock knitting and I am delighted with the pattern which is made automatically. It was not difficult to match the yarn so that the socks have the same patterns. I love my Altai! Sooooo soft and bright, very nice in work. I made fingerless crocheted mittens and it look fab! Which colors did you use?